A couple of weeks after I got back from the States, a ‘client’ was in town and visiting. We’d been in touch a lot and I was super excited to be working with her. She’d become a friend, plus she was an important client. So naturally we met up for a spot of tea. It may not look like a super impressive spread, but quality not quantity! Plus this was just before we would both head off to our respective dinner plans so we didn’t really want to spoil our appetites. But if someone’s offering you French pastries at Ladurée, you definitely don’t say no. 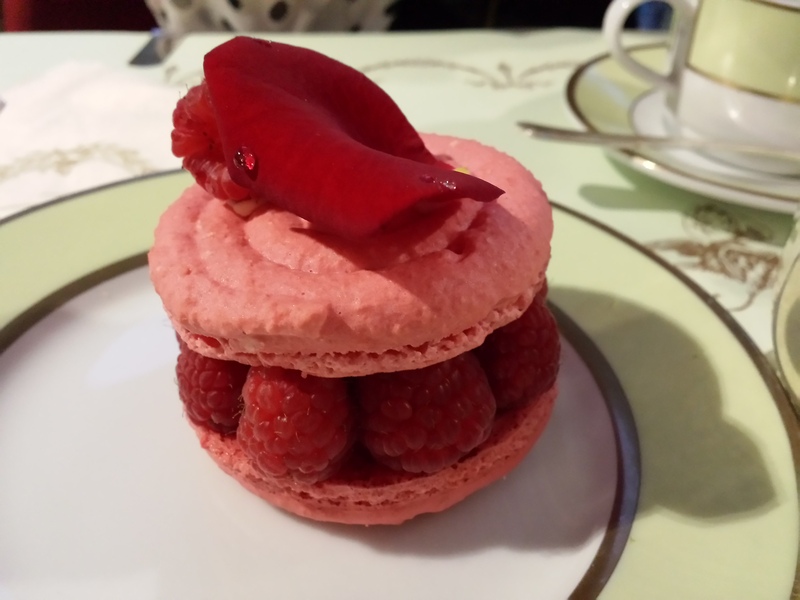 She had herbal tea and an an Ispahan, a rose flavoured macaron filled with rose petal and lychee cream, and embellished with fresh raspberries. I had a bite and had instant pud-envy. 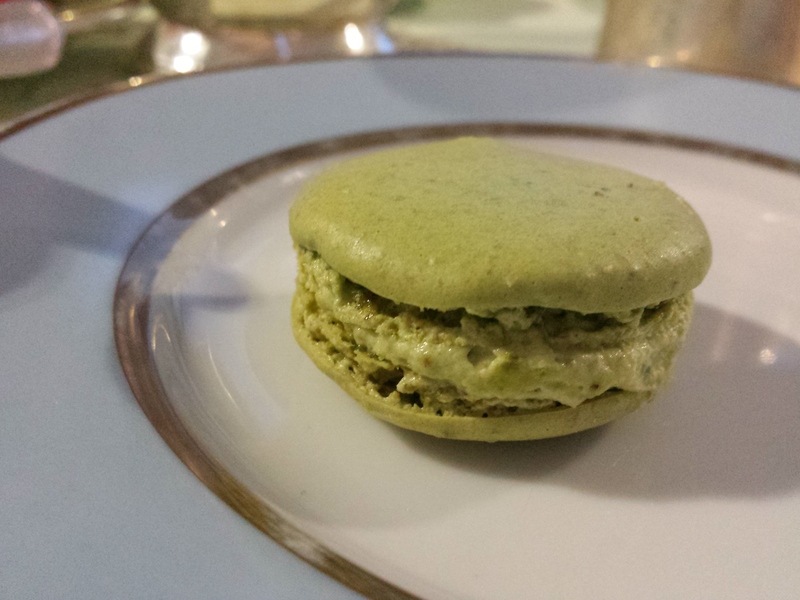 But no matter, my pistachio macaron was more than enough to make up for it. It does look a bit sad, a tiny little macaron sitting on a relatively much larger tea plate all on its lonesome but it was more enough for me. 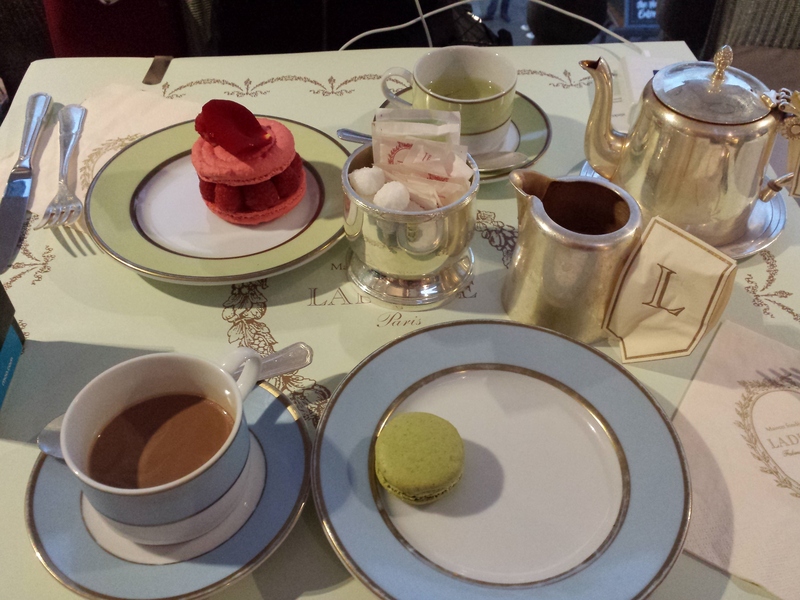 You may have noticed that half-full cup of chocolate-y liquid next to my macaron in the first picture. That was… liquid gold. Probably one of the nicest hot chocolates I’ve ever had. It was thick and hot and creamy (#thatswhathesaid) and oh-so-chocolatey. They give you your own little jug full of that stuff for you to pour out and savour as you wish. 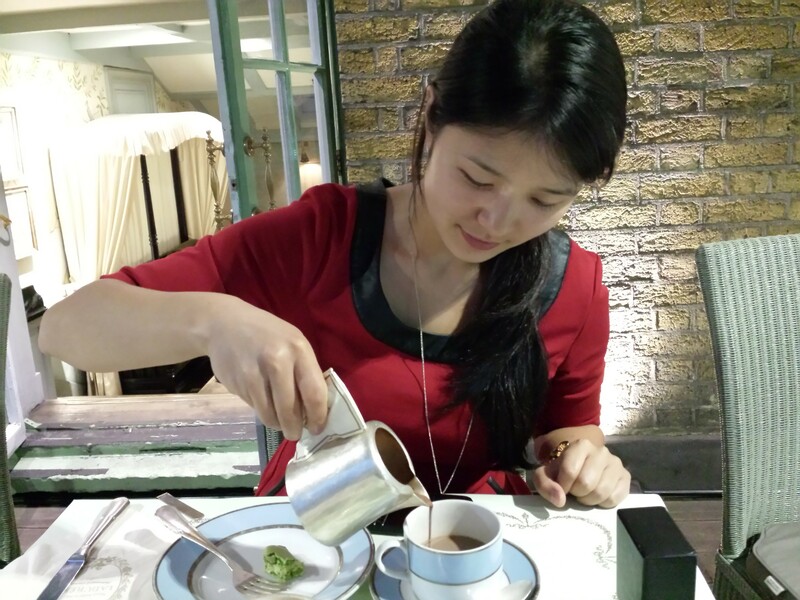 I felt so poshsophisticated with my silver crockery and China mug. I was practically a lady! The only down-side was it was very sweet. Sweet hot cocoa + sweet macaron = sugar explosion. I was almost bouncing off the walls after that. Attractive – not. 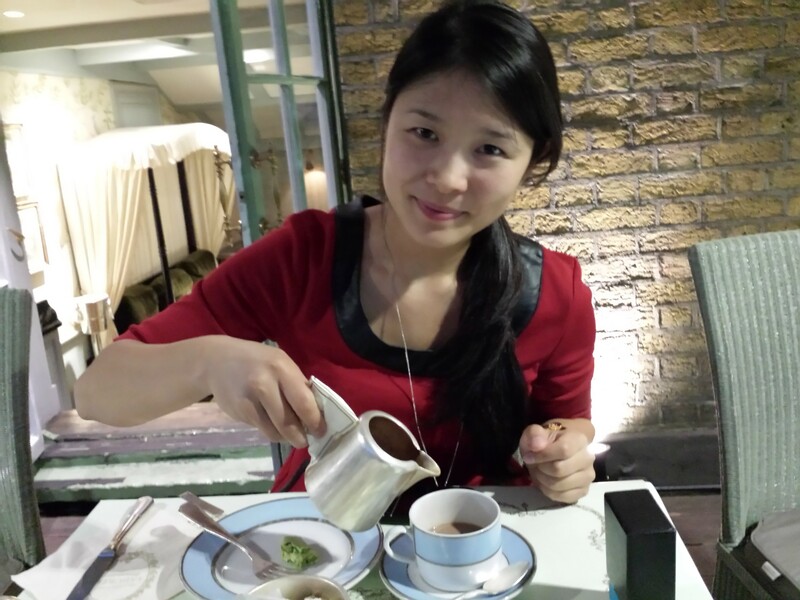 We had a lovely chat and she promised to return to catch up again and I promised to pay her a visit next time I’m in China. Genuinely, I must pay her a visit so please remind me. I’d like you to help keep me accountable please! And in case you’re interested, my lovely red dress was only £20 from Yumi Direct! Definitely no longer in season or stock but they always have some gorgeous clothes! I’d stay away from the coats though as I own two and all the buttons have fallen off multiple times, even after re-sewing. A couple days later another friend of mine currently studying at Southampton Uni dropped by to visit for a day. What did I have planned? A full day of eating of course! (What else, it’s me after all) I don’t think she was expecting it because for some strange reason she thought it suitable to eat before she came. Seriously who would do that. I’m a bit silly in that I don’t have photos of all our meals (it went like this: Beagle brunch, Mien Tay lunch, Spitalfields Market snack, something-else-I-forgot – bad Bobbie, and finally a Five Guys burger to finish… and by then we’d started naming our food-baby-triplets so figured we should stop) probably because some of the places I frequent so often I’ve given up taking new photos (I literally walk into Mien Tay and order – they don’t even bother giving me the menu anymore). But! Beagle was new(ish). And delicious. I say new-ish because I get a coffee there every day on my way to work. Yes they know my flatte (I mentioned it here) and I’ve had a disturbing number free coffees from them via fully stamped loyalty cards. 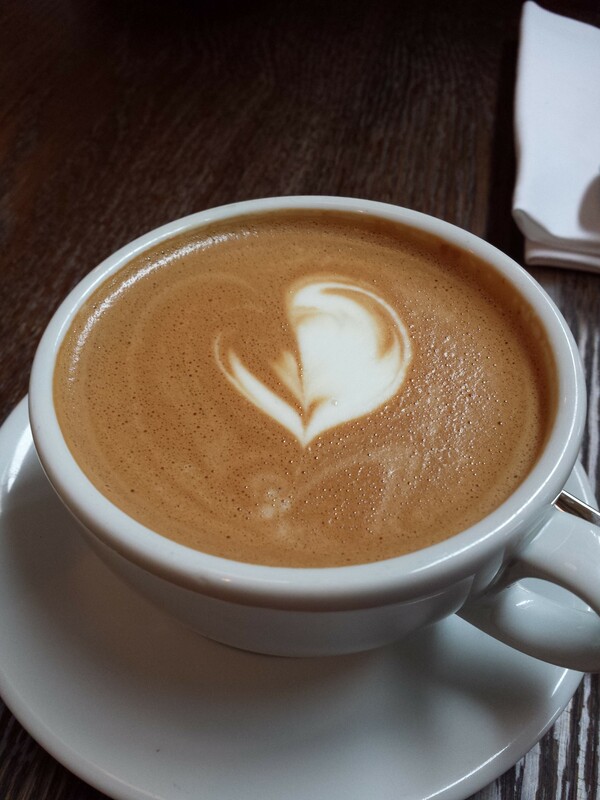 My friend – having already had breakfast (she now knows better, don’t worry) – didn’t go for any food, but did opt for a mocha. 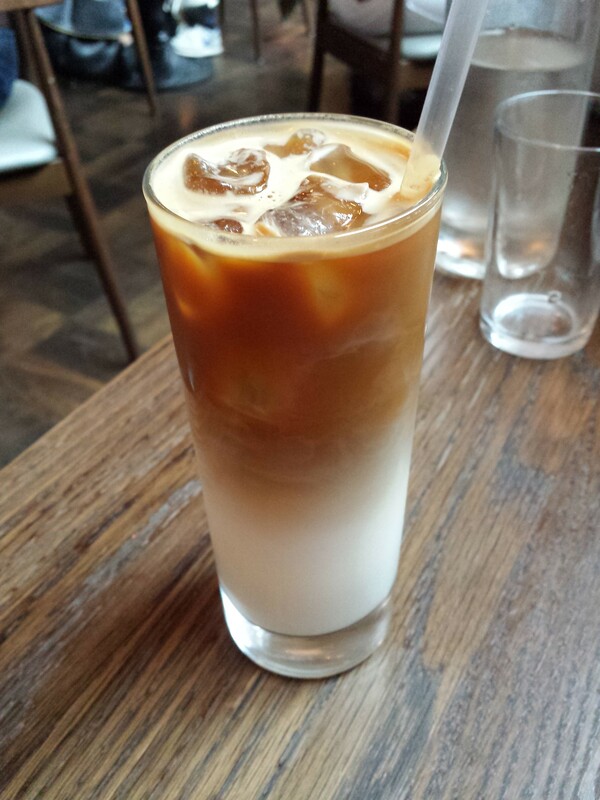 I had an iced latte as I was obviously still missing Californian weather and wasn’t allowing myself to come back to reality of cold, rainy London yet. 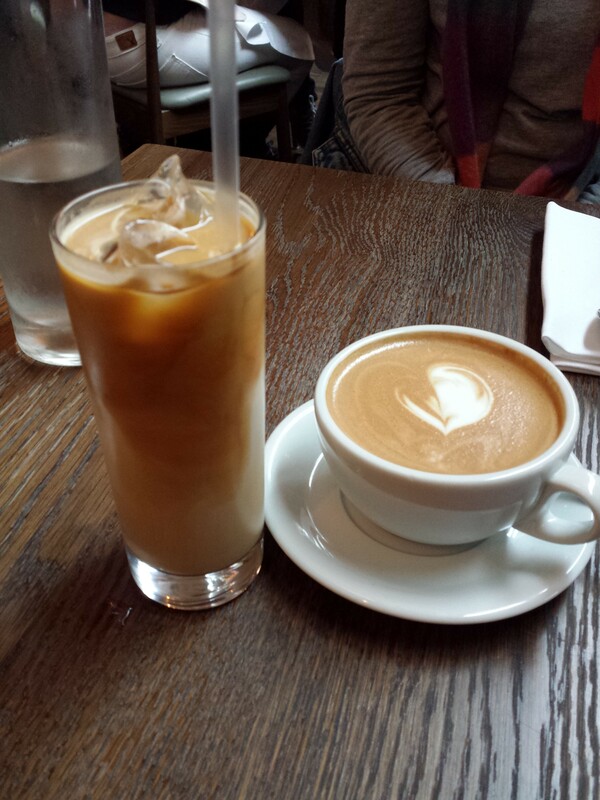 I realised about 5 sips in that it probably hadn’t been a good idea as I was shivering. Oh well. Her not eating was not going to stop me! In Chinese I’m a 吃货 (Google Translate says ‘food goods’ – erm, no. It actually just means someone who really loves to eat. A lot). In English I’m a pig. I prefer the term ‘foodie’ but pig is probably more accurate. This was oh-so-delicious! 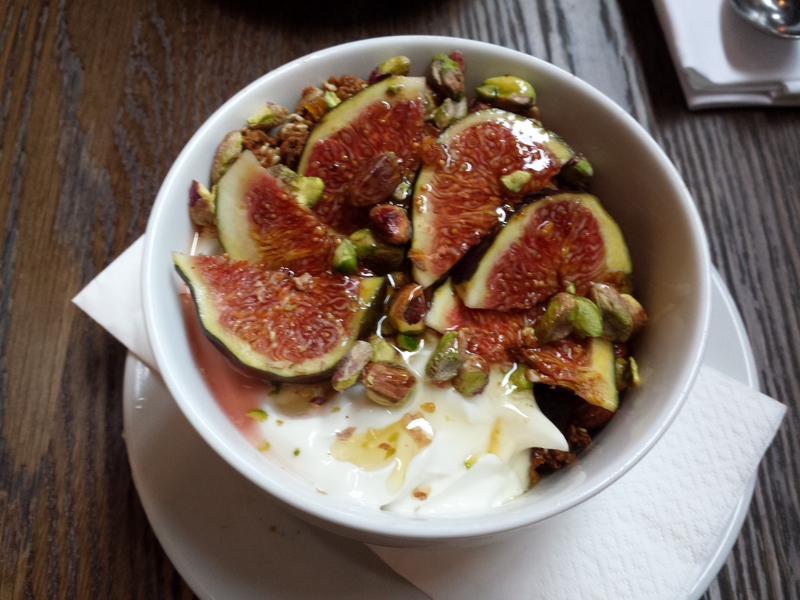 Granola + yoghurt + pistachios + figs + honey. Seriously it was so good. I tried to recreate it when I got home but failed pretty bad as I’d never eaten an actual fig before (I know) and therefore definitely had no idea how to purchase them at the supermarket or subsequently any idea of what a ripe one looked like. And they were pretty integral to the dish. And I’m pretty sure they put something in the granola, it was so delicious and I can’t find anything like it elsewhere. Then later on in the day look what we saw! 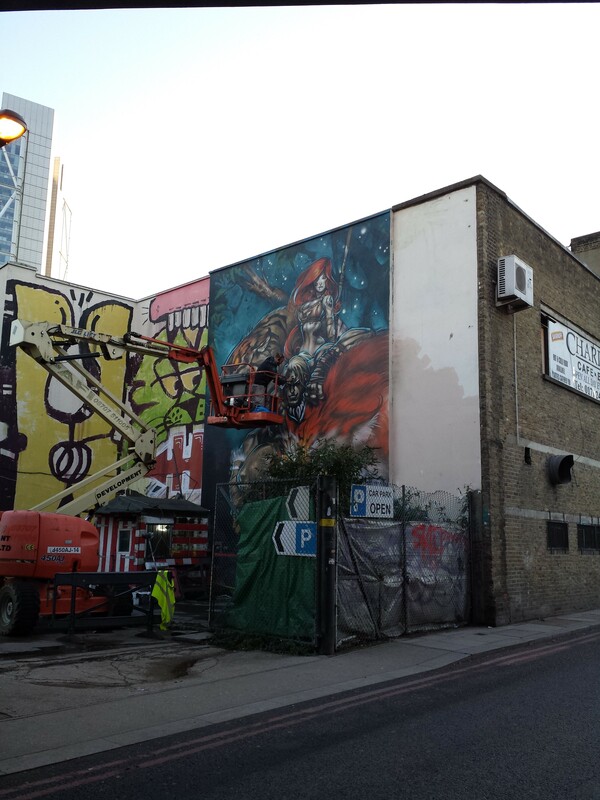 Apart from super cool street art, let me zoom in for you. 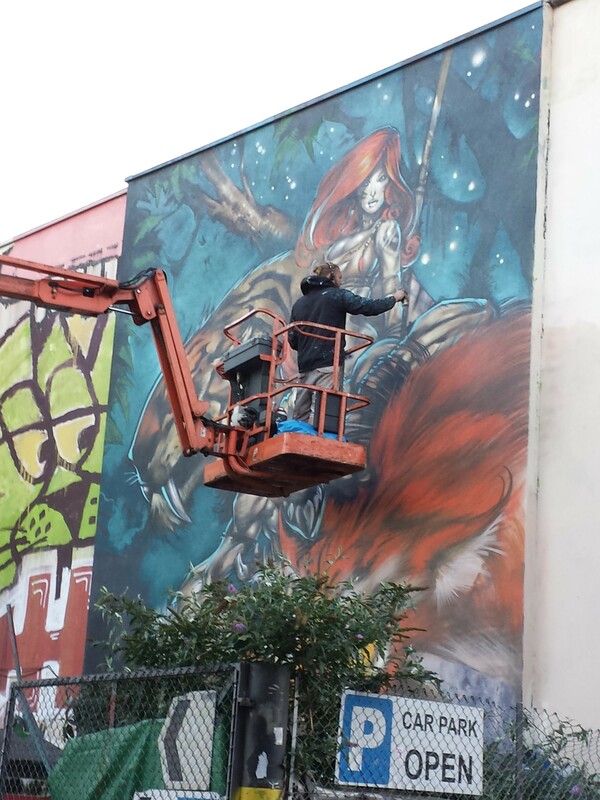 It’s the actual street artist! Working on his masterpiece. With spray paints. FYI, I tried it once, it’s infinitely harder than it looks. I watched mesmerised for a while until my friend dragged me away. I would have asked him for an autograph but he was a bit high. Ba-dum-tss.